Another wonderful and unique offering from Walrus. With just its first phaser engaged, you get a pretty, lush phase sound. With its two in-line phasers engaged, this pedal can make some seriously heavy and crazy sounds. Once you start to play around with the additional effect on each setting for the second phaser, all bets are off. You can create simple phase voices, vast soundscapes, and beautiful sonic washes. Truly a one of a kind pedal. This pedal can be intimidating at first. There are a lot of knobs that have many functions, but it is certainly manageable once you get the hang of it. One particular feature that is superb is the standalone wet mix knob and the standalone dry mix knob. This give you much more control than a single wet/dry knob. Although this pedal is mainly a phaser, it can accomplish a whole range of effects. The three different modes of the second of the two phasers give you a wonderful and vast color palette to choose from. There are many strange and fun sounds awaiting you in this stompbox. The effects that this pedal produces shine through beautifully. You will have no trouble picking out the various unique phase sounds that are created. 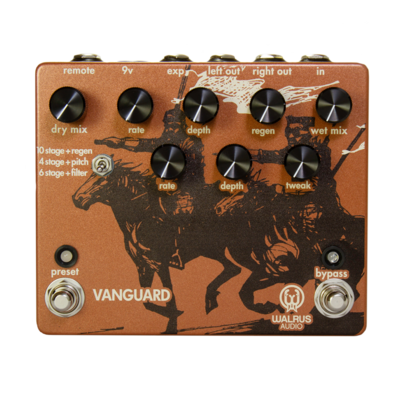 If you have a use for a phase pedal with unique personality, then you will be happy to have the Vanguard on your board. No only do you get wonderful volume and mix control with the separate wet and dry knobs, but the three presets allow for some quick switching between crazy sounds. Manipulating the more complicated sounds on the fly could be difficult. Exact size of the hardy enclosure is 5 ⅝” x 4 ⅝” x 1 ½”.